It is an opportune time for investment for Investment in Residential Buildings and/or gated communities (luxury and middle class) and Corporate office buildings, depending on the location . The prices per square metre of the properties varies from US$ 250 to 1200 depending. Sales departments "en pozo" have gained strength, and we can see pre - sold buildings on almost 70 % before the construction starts. For example, we can cite a department "en pozo" today, after the work had begun, and thanks to the demand, the same department has increased by almost 30% from baseline (within two years). 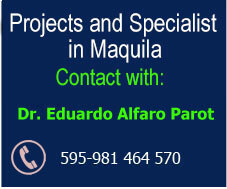 Cost per m2 medium/good construction U$S 550, Sale (Completed) U$S 1.000/1.200. Cost per m2 Construction of first class U$S 800, Sale (Completed) US$ 1.400/1.800, and up to 2,000 U$S. According to recent studies of Paraguay in the last 15 years, about 24% of the lower class have jumped to the middle class -more than 500,000 people- with which the purchasing power of this sector has increased. This is one factors explaining the growth of constructions for middle class people (apartments, duplexes, etc).